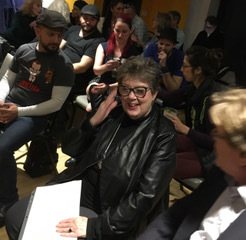 We had a great turnout on Election Night at the early November IAW&A Salon at the Thalia Studio. For a few hours, we escaped the polls and the media and enjoyed a diverse lineup of fresh musical talents, poetry, fiction, humor and memoir. And the Bronx was definitely in the house. 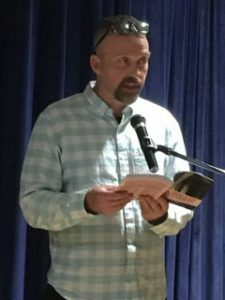 Proud that the online literary magazine, DM du Jour published the excerpt “Schoolyard Epic” from his generational novel Worlds that day, Salon host John Kearns began with a selection from it. A touch football game turns into a battle between sixth- and eighth-grade boys, and becomes a character-defining moment for its protagonist. John fashioned the schoolyard story in the style of Homer’s Iliad and you can enjoy it at DM du Jour. 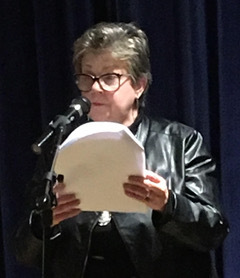 Kathleen Vaughan has been working on a memoir Raised by Nuns and Drunks that details her childhood and the seven and a half years she spent at The Lt. Joseph P. Kennedy, Jr. Home in the Bronx. In this triumphant last section, “Making a Difference,” Kate describes how she used her experience there to volunteer at The New York Foundling Hospital when she grew up. 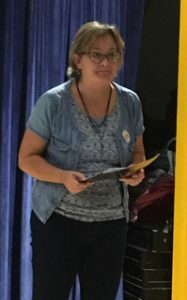 She was able to take children home for weekends and helped some of them reunite with their families. Kate gives tribute to Sr. Theresa Kelly for making these children’s lives more than bearable. 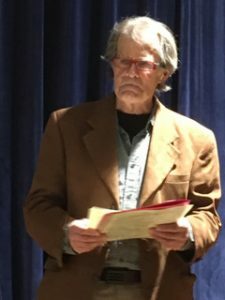 Frequent Salon contributor Gordon Gilbert, Jr. offered a short love poem and a funny, fictional monologue (emphasis on fictional) about a man testifying at a self-help group called BBA, leaving the group’s full name a secret until the very last, eliciting the groans he was seeking in the piece. 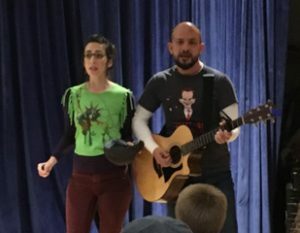 New to the Salon, the indie music duo Hot Glue and The Gun, Carrie Klein and Joel McGlynn, have been writing and performing together for more than six years. 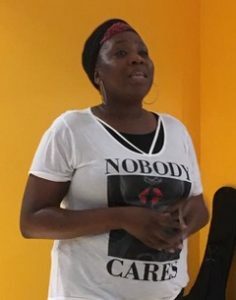 Trained in acting and singing, they offered two original songs “Call Me” and “Holy Silence.” The duo completely engaged the audience by asking for words to incorporate into their performance. Check them out at their website. 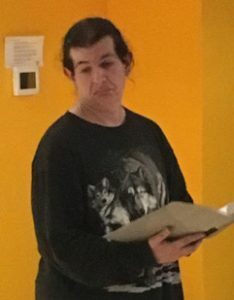 Alan Gary, another first-timer to IAW&A’s Salon, offered selections from his recently completed Something Beautiful, a collection of 100 short universal poems of hope. 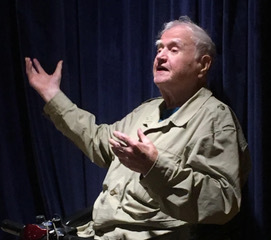 Each entry stars with the idea of Something Beautiful…“In Mercy,” “In Merci,” “Surrounds Me.” Alan was thrilled with his reception, and hopes to find a publisher who shares his vision. 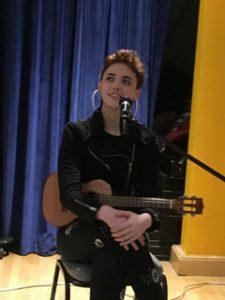 A third-gen McCourt, singer/songwriter Gillian McCourt showcased her talent by singing two original songs composed on her ukulele. They were “Ordinary Birds” Let me fly with those ordinary birds, and her brand new, “Been There.” Gillian also read a short poem about the city, composed when she was 9, proving they start young in the McCourt household. The inimitable Rosina Fernhoff read “Zillah’s Letter to the President” from Tony Kushner’s 1985 play, A Bright Room Called Day. 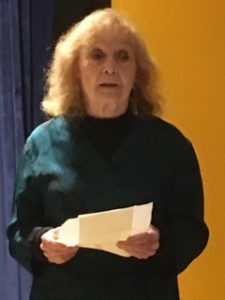 Rosina notes that though written during Ronald Reagan’s presidency, she felt it apropos to the political climate under the Trump presidency and administration. 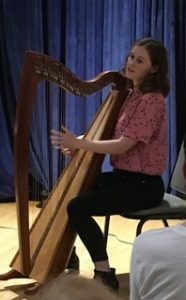 Making her Salon debut, Niamh O’Brien, harp player, singer and composer originally from County Limerick wowed the crowd with a selection of songs. They ranged from the English folk song “Wee Weaver,” a traditional reel “Kylebrack Rambler,” the Julia Jacklin song “Don’t Let the Kids Win” and by audience request, “Slán le Maigh,” a traditional Irish song from Limerick. You can see her on November 30, performing in Brooklyn with female Irish traditional musicians and at the Scratcher Sessions (East Village) on December 2. Please e-mail Niamh or visit her website to learn more. Our closer, Malachy McCourt, surprisingly did not talk about the election that day. 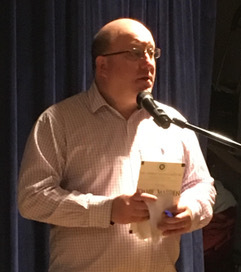 Instead he talked passionately about the 100 year Anniversary of Armistice Day on November 11, citing the brutality of war and terrible toll of World War I. Malachy recited the 1918 poem by the English soldier and poet Siegfried Sassoon, “Does it Matter? Till next time, November 20th, 7PM at The Cell.